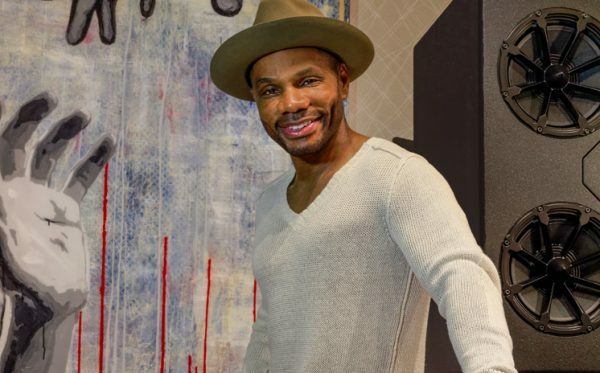 Multi-platinum gospel artist Kirk Franklin recently completed the transformation of a vacant furniture warehouse in Downtown Arlington into a $2 million, state-of-the-art recording studio unlike any in the country today. Fo Yo Soul Entertainment, which opened in November, is located in a two-story stone and glass building at 102 S. Oak St. The 9,000-square-foot structure, originally built in 1968, was extensively remodeled with specialized construction techniques designed to block outside noise and vibrations from downtown traffic and the nearby train tracks. But that’s not the only thing the makes the building unique. It’s also the first recording studio in America known to feature prototype technology that can change how large the space sounds, making it seem as intimate as a jazz club or as spacious as a cathedral, with a few simple taps on a computer screen. Franklin’s recording studio was designed by the Russ Berger Design Group, a North Texas firm whose experience includes projects for the University of Texas Dallas, Lakewood Church and NFL Films. Transforming the furniture warehouse into a state-of-the-art studio required creative engineering, especially since the building is close to a busy rail line. To prevent outside noise and vibration interference, the original slab was dug out and the walls and ceiling were anchored to a new “floating” slab, said Russ Berger, president of the Russ Berger Design Firm. “Nothing touches the outside structure. You don’t have any vibrations from the train. You don’t even know it’s going by,” Berger said. Franklin’s studio also features a prototype electronic architecture system typically found in much larger venues to correct or enhance acoustics, Berger said. The Electronic Architecture: Studio system, made by eCoustics Systems, has a pair of microphones that capture the sound within the room – whether that’s singing, instruments, or clapping. It then digitally creates the pattern of reflections and reverberation that match the kind of acoustical environment the user has selected, reinforcing that sound back into the room through the speakers distributed across the walls and ceiling. What I wanted to do was announce that we are interested in supporting the arts, whatever the form.”Franklin, who has won 12 Grammy awards, is expected to begin recording a new project at the studio this fall, said Ron Hill, president of Fo Yo Soul Entertainment. Some of the new studio’s recent clients include gospel recording artists Tasha Page-Lockhart and Marvin Sapp, Hill added.“Fo Yo Soul Entertainment would like to thank Alan Petsche and The Petsche Group for making this dream become a reality,” Franklin said. This entry was posted in Gospel, Interviews, Reviews and tagged Arlington, Kirk Franklin, recording studio by Kris Patrick. Bookmark the permalink.